SKU: books-741. Category: Air Force, Photo and art albums, Red Army, World War 2. 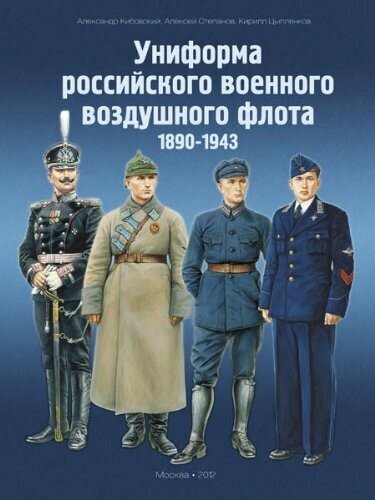 Russian military aviation Fund “Russkie vityazi” together with the team of authors of the Russian military historical magazine “Old Zeughaus” has prepared an illustrated album about the uniforms of the Russian aviation since the time of Emperor Alexander III to our days. The main value of the proposed material – original documents, allowing for a scientific basis to trace all the circumstances of the occurrence, existence and cancellation of items and shaped special suit used by the Russian aviators during the described period. The majority of archival documents and original drawings presented in the book, discovered and first introduced into scientific use the authors. Drawings and photographs as illustrations, supplemented by images of the authentic items from Museum and private collections, as well as color schemes and models, reconstructions, made by the method of computer graphics. The book is addressed for people interested in military aviation, researchers of the history of the army and Navy of Russia and the USSR. In this edition chronologically traces all the changes of uniforms, badges and flags of the military air fleet from 1890 to 1943.